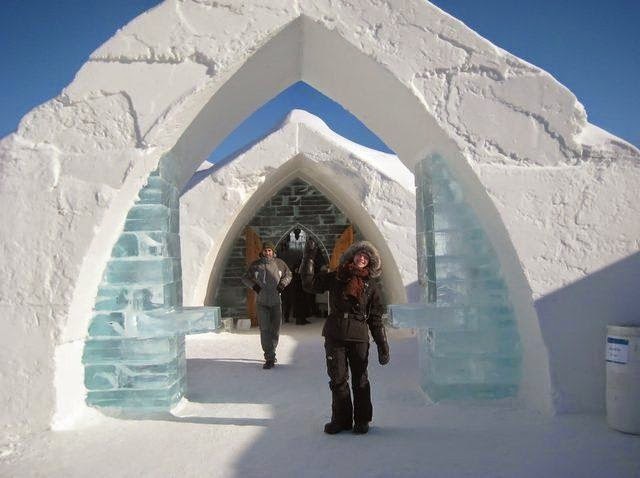 An ice hotel is a temporary hotel made up of snow and sculpted blocks of ice. They may be visited by adventurous travelers that are comfortable with the outdoors. Ice hotels are dependent upon sub-freezing temperatures, are constructed from ice and snow, and typically have to be rebuilt every year. Ice hotels exist in several countries, and they have varying construction styles, services and amenities, the latter of which may include ice bars, restaurants, chapels, saunas and hot tubs. Ice hotels are promoted for adventurous travelers who are interested in novelties and unusual environments and are comfortable with the outdoors. Customers have to be prepared to sleep in beds made of snow or ice, but in the warmth of furs, blankets and sleeping bags designed to withstand extremely cold temperatures. Temperature in the rooms is below zero Celsius, but much warmer than outside. Lobbies are often filled with ice sculptures, and food and drinks are specially chosen for the circumstances. 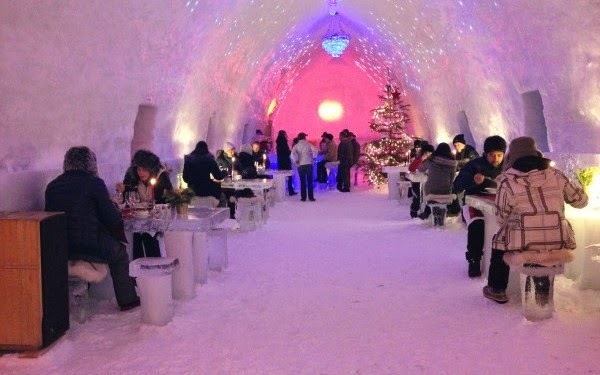 For instance, glasses in an ice bar can be made of ice and people sit on benches made of ice. 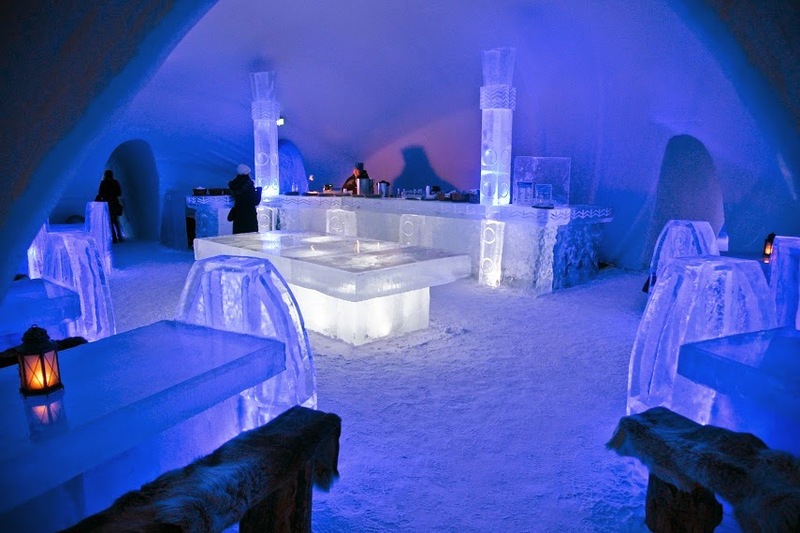 An ice bar, sometimes associated with an ice hotel, is a drinking establishment primarily made of ice. Ice hotels are dependent upon sub-freezing temperatures (colder than 32 °F or 0 °C) during construction and operation. This imposes time constraints on construction and makes the hotel's season short. Construction typically begins between November and March when snow can be compacted and thick levels of ice form. Although constructing an ice hotel is more labor-intensive than a regular building, building materials are cheaper.Ice hotels have to be reconstructed every year. This is not entirely detrimental to the operators; if an ice hotel does not meet its financial goals, the owner can simply let the building melt in the spring and is left with no building to permanently upkeep. The walls, fixtures, and fittings are made entirely of ice or compacted snow, and are held together using a substance known as snice, which takes the place of mortar in a traditional brick-built hotel. Sometimes steel framing is used in their construction. 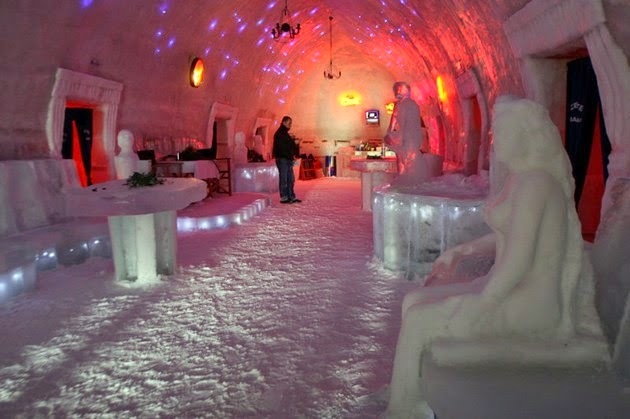 Bâlea Lake Ice Hotel, the first ice hotel in Eastern Europe was built in 2006 in Romania, deep in the Făgăraș Mountains, at an altitude of 2034 meters. In the winter, it is only accessible by cable car, because national road DN7, the Transfăgărășan, is closed in the winter. This picturesque setting is next to Bâlea Lake, where each year local craftsmen wait for the lake to freeze, before using the ice to build the small 12-room Ice Hotel and its adjacent Ice Church, Ice Restaurant and Ice Bar. Local artists imitate sculptures by Romanian modernist sculptor, Constantin Brâncuși. Typically the hotel is completed in December and is open until it melts in late March or April. Bedding, furs, specialist sleeping bags are all provided, with bathroom facilities nearby. There are two chalets within walking distance, which also provide accommodation. Activities such as skiing, sledging or riding a snow bike are on offer. Those who are more organised and adventurous can arrange heliskiing. 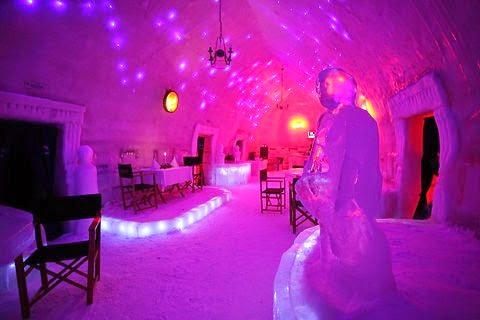 The Bâlea Lake Ice Hotel is Romanian owned, but has a relationship with a travel company Untravelled Paths Limited, based in the United Kingdom.